Can I replace my anti-siphon valves with a back flow system on my own? I'm having repeated trouble w/ the anti-siphon valves on my irrigation system. 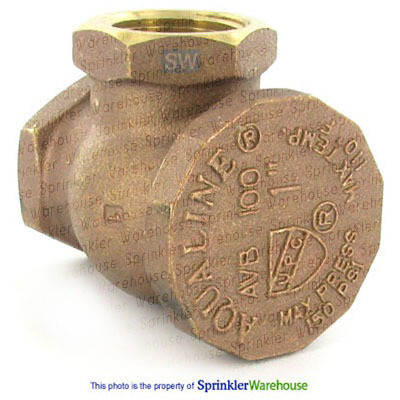 I believe they are inappropriate for my yard, and want to replace them w/ underground in-line valves and a back flow device, like a double-check, and I'm having trouble determining if this is something I can do on my own w/ equipment ordered from this site. My yard is about an acre w/ some elevation changes. The sprinkler set up is near the water main on the house, approximately dead center on the lot. I have 8 zones, all controlled by standard Home Depot orbit anti-siphon valves. These valves repeatedly fail (possibly due to the fact that we are in a desert climate in Southern California and they are in the direct sunlight most of the day, or they are just cheap), and due to the elevation changes, 4 of the valves are way lower than the sprinkler heads they feed - they would have to be about 10-15' off the ground to be above (instead they are all mounted in a row about 24" off grade), so the area around the valves gets soaked every time the system runs, which is bad as it is close to the foundation. I know I could move the valves up the hill, but then I would have to dig up some landscaping to run control wires. My preferred solution would be to spend a few bucks and replace these ugly above-ground valves with a better in-ground inline valve system. I know I would need to add a back flow prevention device to make this safe. My research indicates I may be able to use a double-check valve, which can be installed 12" above grade, then feed down to my new 8 inline valves buried in boxes. - Can I do this? Everything I read says consult local codes, but I can't find anything on my city's website and they aren't returning calls. I'm in the city of San Diego. - I asked a guy at the Irrigation supply store in town, and he said this device could only be installed by a licensed back flow inspector - does this sound right? - Does the set up I describe make sense? I know it will cost me more than options like replacing the anti-siphons with a better quality product or moving them up the hill, but this seems like a better long-term and aesthetically improved solution. Am I high on PVC glue? A big thanks in advance for any direction that can be offered! As long as you stick with the antisyphon valves, life is simple, from the viewpoint of ownership. You do have to relocate valves so that they are higher in elevation than the sprinklers that they feed, but for the hundreds of dollars you will be spending up front for to install an RPZ backflow preventer, and maybe even more, in annual inspection fees, the old ASV might not look too ugly. You would do better to not choose the Orbit valves. Irritrol, a brand owned by Toro for some already-established product lines they acquired, has the 2711APR valve in the 3/4-inch size, and the 2713APR in the 1-inch size. 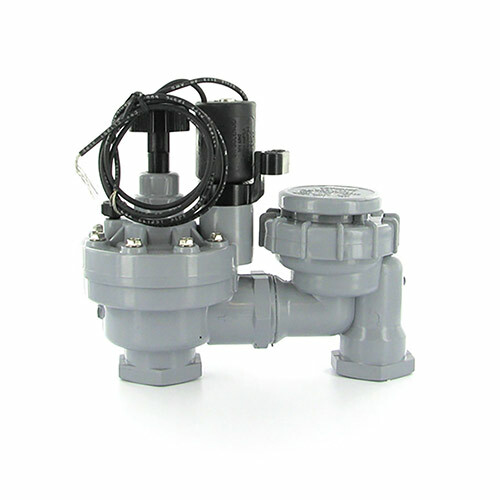 If you were pinching pennies to get to being a user of Orbit valves, you might explore a big box store, to see if you can find these valves in their consumer version (usually branded Lawn Genie 54000) for a good deal less. Pros don't install the consumer version, because it lacks the manual-operation lever found by the solenoid, although the bleed screw still allows for manual operation. Is there any easier way than re-trenching to run the automatic controller wires out to the (new) uphill anti-siphon locations? Should you go this route, it might be that your most economical form of added vacuum breaker will be a non-electric manually-operated form of the Irritrol/Lawn Genie antisyphon valve, as the vacuum breaker portion is not available as a standalone device. Note that no matter what brand of ASV you choose, the moving part in the vacuum breaker will need occasional replacement, and the Irritrol parts will always be available when needed. Before brass got to be so costly, a vacuum breaker in common use was the Champion 262, now available by way of numerous import copies, all of which use the same Champion repair parts.